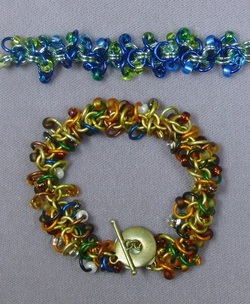 Wire, Metal & Chain Maille - Bead It! Learn to play with wire! We will go over some basic techniques to get you familiar with working with wire. Then we can either help you create a design you are interested in or play! Using the wire-wrapped loop technique, learn how to create this fun bracelet on chain! 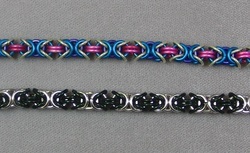 The same technique can be used for earrings and necklaces, too. Check out the Sundance Catalogue - there are lots of pieces created using this technique; it's Chris's favorite catalog for inspiration! ***Special Sale*** $15 plus supplies! 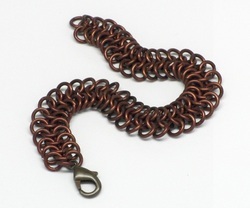 This basic form of chain maille is not as hard as it looks. It's really fun to work with jump rings, so different than other things we do, come give it a try! This is the class to have fun with jump rings! We have great colorful jump rings, and pair them with size 6/o seed beads and you have a lightweight musical bracelet! This is a great slinky bracelet! 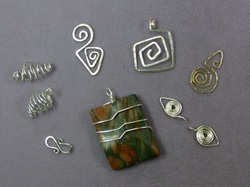 Learn to texture and dome metal blanks and wire shapes to create artisan jewelry! This class is wonderful therapy. Using wire and 11/0 and 8/0 seed beads, have fun creating this dragonfly that can be used as a pin, pendant, or whatever is in your imagination! So easy and so gorgeous! This makes a great every-day-bracelet ... Chris has been wearing hers every day for 10 years! This is a cool looking version of chainmaille! Create this ever so popular wire tree yourself! 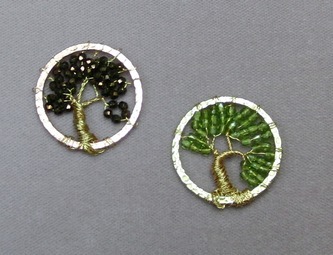 Did you like the Tree of Life? How about this one! Sooo cool on a stone! Great technique with wire! Perfect for getting your feet wet with wire or adding another technique to your wire repertoire! Great new class! Learn to do a little work with wire to create this stunning bracelet using faux sea glass. Totally adorable and perfect for Spring! Using sterling silver, silver-filled, gold-filled, or craft wire, create these fun earrings while learning basic wire techniques. Learn to create this gorgeous ginko leaf with wire. 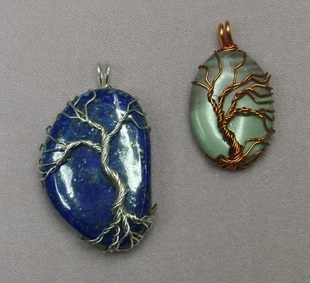 Using wire and random beads, learn to create wonderful wire pendants. Playing with wire is fun! Playing with wire is fun, but harder than you think. Join us to learn the techniques used to create these rings ... and as a bonus, learn this cool two wrap bail! Learn to create your own chain with wire! Have fun with wire! 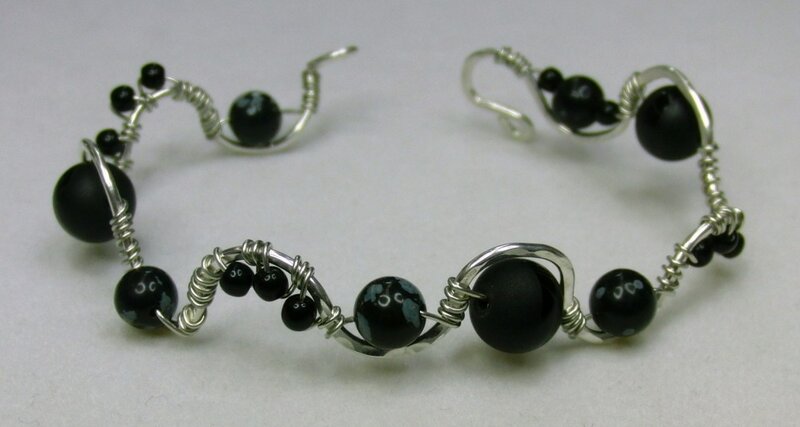 Using two gauges of wire and whatever beads you choose, create this great bangle. Donna has been playing with wire again! Benefit from the bounty of her knowledge by learning this fun technique to create a great bangle. 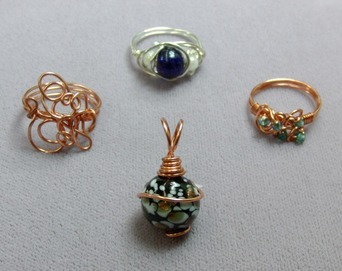 Learn to cage a cabochon or flat bead with square and half-round wire. Make decorative loops and bends, custom shaping it to your cab with elegant and professional results!